Nimbit Artist of the Week: Livingston Taylor! 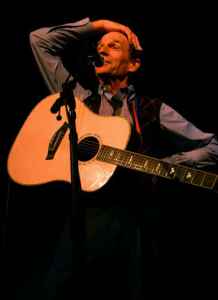 Boston’s Livingston Taylor began his career as a performing songsmith nearly straight out of high school, having first picked up the guitar at a spry 13 years of age. His songwriting (seemingly seasoned straight out of the gate) and personable, relatable stage presence garnered notice from live music fans and critics alike. 1970 saw him land his first record deal, releasing his eponymous debut on the esteemed Capricorn Records. Last year—that’s 44 years later—he released Blue Sky, his 18th. Having performed around 80 shows per year in that timespan, he’s really played any type of gig you can imagine, from coffee shops to large festivals to opera houses, landing a couple of Billboard charting-hits along the way: “I Will Be in Love with You,” and “First Time Love.” And it’s that breadth of experience (well, okay, and also his songs) that landed him the coolest gig he’s ever had: that of Professor at Berklee College of Music—a post he’s held since 1989. His discography, most of which is available via his Nimbit store, is peppered with a couple best-of collections, a covers record, and also a sort of self-cover record. Good Friends finds Livingston taking some of his more familiar tunes into decidedly jazzier territory—great for established fans that enjoy a new spin on the familiar. Furthermore—and we don’t see this too often at Nimbit—he has distilled his Berklee teachings down into a good ol’-fashioned book, “Stage Performance,” which is also available for sale. Click here to visit Livingston’s Nimbit Store.